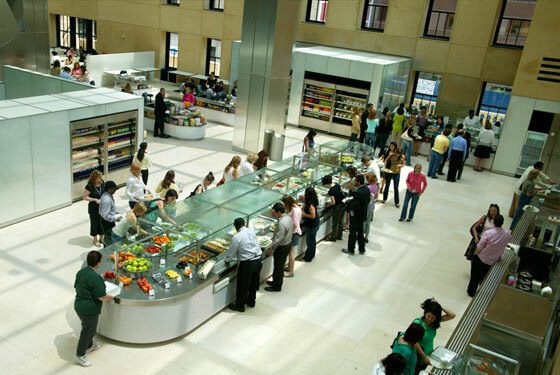 Google may have the cafeteria to beat out here on the left coast, but in New York they have to make do with Conde Nast cafeteria, which apparently serves fancy salads and tacos (??!) to people who don't like to eat. Frank Gehry designed the whole thing, which is supposed to somehow redeem the whole enterprise. 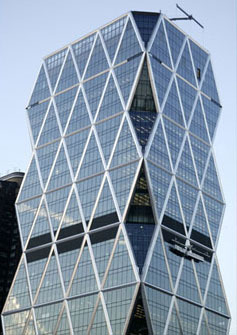 Anyway, Hearst Corp., for its New York headquarters, recently opened a Norman Foster-designed office tower stunning enough to make Graydon Carter red with jealousy. For the coup de grace, the company has put together its own fancypants cafeteria. Whereas the Conde Nasties only have sushi once a week, Hearsters feast on maguro and toro daily. They are also eating steak (well, skirt), Mangoes, double-chocolate pudding and something hideous from Oprah's O Magazine. Grub Street has full details. The real question around these parts is whether Hearst will put a Google-worthy cafeteria in any of the office buildings it is looking to buy in San Francisco, starting with 400 Montgomery. After all, if Cosmo and Esquire are good enough for subsidized gourmet meals, then aren't the ink-stained, Barry-Bonds-busting folks at the Chronicle worth some decent grub? Ya, they're probably not holding their breath.